Imitation may be the sincerest form of flattery, but Wu and Carlson call Forever 21 out for “unfairly profiting” from 15 years of artistic development. (It doesn’t help that Forever 21’s promotion of cheap, disposable clothing runs completely counter to Feral Childe’s mission.) “It’s frustrating that this enormous company, with over a billion dollars a year in revenues, would dare to poach the artistic creations of a small company such as ours,” say the designers. It looks like Forever 21 simply photocopied Feral Childe’s Teepees print onto an off-white romper. Upon close examination, the similarity between the two designs is hard to dismiss. In fact, it looks like Forever 21 simply photocopied Feral Childe’s Teepees print onto an off-white romper. Because Wu and Carlson registered Teepees with the U.S. Copyright Office, they’ll be taking “appropriate legal action” against the apparel giant, which has faced similar copyright battles with other labels in the past. “It simply is not fair that another party profits from artwork that was not created by them, was not their idea, and does not belong to them,” they say. No guesses who we’re rooting for. Are you familiar with WTForever21? http://WTForever21.com - very amusing - and recently engaged in litigation with F21. At the risk of stating the obvious, we have millions of well-intentioned shoppers who just lack the resources to discover original and independent fashion. Right now, we're programmed to get our fashion from the mall. However, here in Southern California, there is a definite trend toward seeking out smaller labels, and creating your own fashion with thrifted and vintage items. It's a step in the right direction, and the more we hear about The Man (a.k.a. Forever 21, Urban Outfitters) stealing ideas, the more it's going to push people away from them. 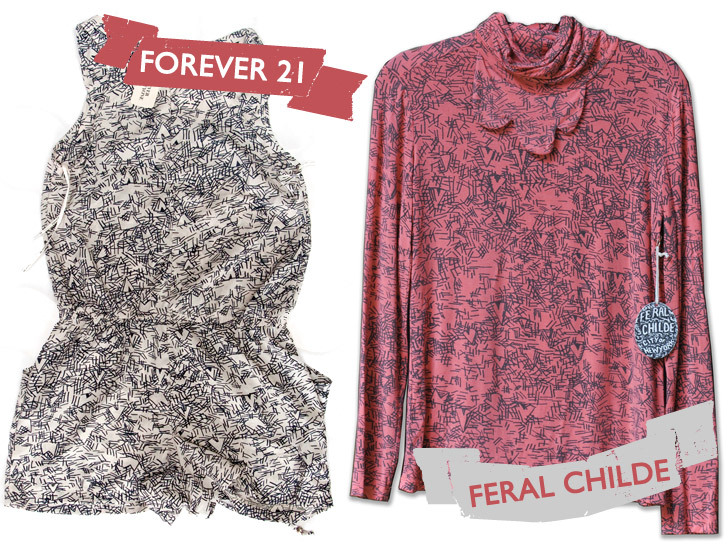 Forever 21 is embroiled in yet another legal kerfuffle, this time with Alice Wu and Moriah Carlson of Feral Childe. The designers have filed a copyright infringement lawsuit against the fast-fashion company for allegedly stealing one of their designs and passing it off as its own. 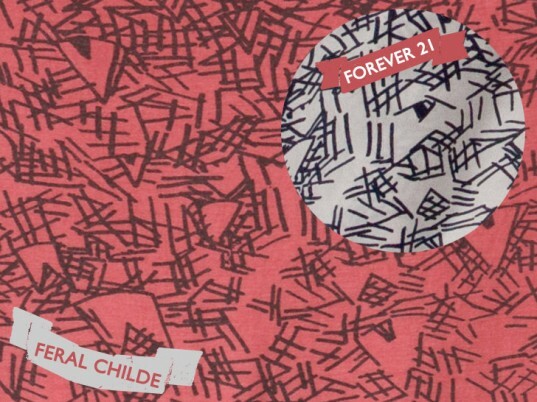 The print in question is Feral Childe's hand-drawn "Teepees" print, which featured in "School Play," the label's Fall 2009 collection. "The Forever 21 garments appear to reproduce Teepees exactly," Carlson and Wu tell Ecouterre. "If compared side by side you would not be able to distinguish any difference in the artwork."